I have a date/time field but all entries need to be a minimum of 2 business days out. Is there a way to set this condition? Do you want to calculate the days based on multiple date/time fields with a minimum amount of days, or there is something else? Please provide more information, and we will see if there are any options available. These fields are for the user to designate a “launch” time that cannot be take place until 2 business days after the time they are placing the order. So the time entered must be 2 days or later from the time they are actually placing the order. We start sales conversations. Rainmaker is a sales strategy company with a comprehensive system that mimics the behaviors of top sales people. We call this Prospect Automation, and it will change the way you sell. Prospect Automation fuses proven selling techniques with compelling content to effectively engage more prospects. I understand that you want the users to place orders atleast 2 days before the launch. You can achieve this requirement by calculating the difference between current date and launch date that are placed on your JotForm. Setting up a similar condition as below might help you in achieving your requirement. Hope this helps. Please let us know if you need further assistance. Hi – my options do not match what you sent me yesterday – see this image from my screen vs what was sent from JotForm below. Your screen shot shows a “Then” option with a dropdown, while my “Then” option wants me to ‘set mask’ – how do I access the condition you show in the solution sent to me yesterday? Please be noted that replying to the forum response through email, the attachments cannot be attached to the forum. However, as per the description provided by you it seems that a different option has been selected from Conditions Wizard. 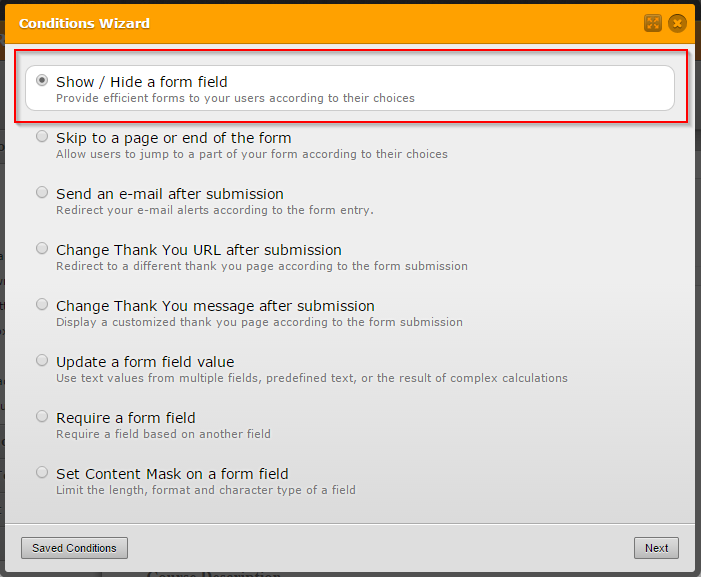 Please select Show/Hide a form field on the conditions wizard so that you can set the condition as required. Well we are almost there – here is my screen. The problem now is that the “Please select” option after “Show” on the second line is a drop down of fields on my form. There isn’t a “yes” or “no” to engage as there is in the example provided to me earlier. The 'Yes' represents a Yes field on Kiran's form.